Lachi's Key Lime Pie : Something new for the sugar foodies!! 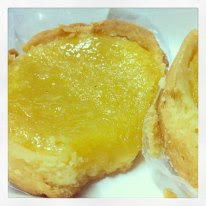 I am an egg pie/egg tart foodie. I was a able to sample, eat ( and gobble!) egg pies from different pastry shops here in Davao. But I am not going to talk about it today, it's about its equally mouth-watering but distinctively delightful cousin, the Key Lime Pie. Sounds a bit sour, eh? Actually, I have never tasted lemon pies so this is something new to me. My 'relationship' with this dessert started last week when my good friend Ron had to come by to deliver an invitation for his baby's christening. I took advantage of his perky self when he called, and kinda made lambing to bring me some merienda (snack) treat. Though I didn't expect he would take it seriously, I was happy as a lark when he handed me a boxful of treat. When I opened the box, at first I thought they were egg pies so I hastily grabbed a bite. If you're used to eating uber-rich and extra sweet pies, the hint of lime which gives it a sharp flavor will sure to give your face a funny expression. I had to pause for awhile after that first bite to let the taste sink in my palate. Hmm, this is indeed sour. But guess what, after a few seconds, I was craving for another bite, then third, then some more until I finished off one piece. I don't know, but once you've tasted it, you'd keep wanting for more, maybe because it has just the right amount of sweetness unlike the other pies we loved and knew, which would usually make us tummy-sick if we 'excessively' eat them. That feeling. However, I suggest not to eat this on an empty stomach, since lime has acidic properties. You might hear your tummy grumble, if you don't. I love its flavorful crust as much as I love the sourish creamy filling, giving zing to the pie's distinct character. Now, if you are wondering where Ron bought this must-eat heaven of a dessert, head over to Lachi's, the famous home of Sans Rival in Davao. It is priced reasonably at P45 a piece. Affordable, isn't it? To contact Lachi's, like their Facebook page here. I have tried key lime pie here and it's delicious! Hmm. Now I am curious how it would taste like in my own palate. LOL! I so love egg pies and tarts too but a lime pie sounds new to me. I haven't tried one as of yet. Thanks for the yummy share. Honestly, I am drooling over here. I'm not sure why my taste buds don't like key-lime pie. So sorry :( I ordered a whole pie the last time we were in NY but none of my relatives even helped themselves. I'm not sure, maybe the pie I bought didn't really taste good or the pie was just too sour for our discerning tastes. Seems yummy, but I fancy not pie. Oks na sa akin ang pan-de-coco. you are welcome. they are so good, no?